1 What Is Keratosis Pilaris? It is a common skin disease that is characterized by formation of hard plugs inside the hair follicles. This is an annoying condition but not usually serious in nature. It commonly affects children and often resolves in adults with increasing age. However, some individuals suffer from a serious form of this disorder that persists for most part of their lives. The ICD 9 Code for Keratosis Pilaris is 757.39. 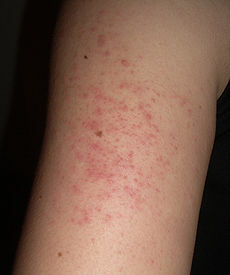 The condition makes the skin look bumpy and occasionally red in appearance. The lumps are small in size and about the magnitude of a grain of sand. These are usually skin-colored in appearance but can also be red and swollen at times. Sometimes, the region around the bumps appears slightly pinkish. The acne-like humps are painless though itchy at times. The disease is quite similar to another condition known as Pustular acne. 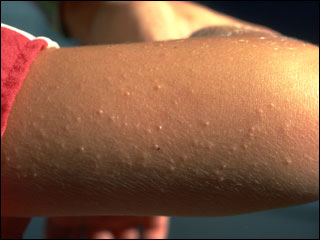 Unlike Pustular acne, however, Keratosis pilaris bumps arise on rough, dry skin patches and are smaller in size. The bumps caused by the disease may show an improvement, particularly during the summer season, only to deteriorate at a later time. This is proved by the fact that the disease generally worsens in winter and often clears up during the summer months. Generally, these humps show a gradual resolution even in the absence of any treatment. The lumps generally appear on the legs, thigh, outer upper arms and buttocks. However, it may also arise on the face and look similar to acne lesions. When arising on the face, the bumps may leave scars unlike in cases where they originate over other areas of the body. In mild cases, tiny bumps, which look like “goose bumps,” are seen on the back (posterior region) of the upper arms. When touched, the surface of the papules feels like extremely coarse sandpaper. Single bumps are tiny, skin-colored lesions that form inside hair follicles (openings). The condition usually results from the accumulation of a type of hard protein in the skin known as Keratin. It protects the skin from infection and harmful materials. The buildup of this protein leads to the formation of scaly plugs within the hair follicles. The plugs obstruct the opening of the hair follicles. Generally, multiple plugs are formed which give rise to rough patches and bumps over the skin surface. It is not clear why there is an accumulation of the keratin protein. The buildup is generally supposed to be associated with underlying genetic disorders or underlying skin conditions like Atopic Dermatitis and Ichthyosis Vulgaris. A hereditary association is often suspected as the disorder is found to affect generations of the same family. However, it also originates in people who are healthy otherwise. It is not definitely known whether people with dry skin are truly susceptible to this disease, as is commonly suspected. However, dry skin tends to deteriorate this condition. It is more common in individuals who have very dry skin. It is also found to affect patients of Atopic Dermatitis (Eczema). The condition is quite common in young kids. However, it may affect individuals of any age group. As aforesaid, the condition has some associations with disorders like Ichthyosis Vulgaris and Atopic Dermatitis. People with dry skin are also susceptible to this disorder. Usually, physical examination by a health care provider is enough to make a diagnosis of this ailment. In normal cases, testing is not necessary. No skin test or laboratory examination is commonly conducted to identify the disease. Doctors typically rely on an examination of the skin and a consideration of the medical history of the patient. Dermatologists are usually able to detect the condition by examining the “horny plugs” or the little skin plugs formed by an accumulation of keratin. Patients may also be asked about the signs and symptoms that they are experiencing. Once the disease is identified, medical treatment is usually unnecessary. Medications are not prescribed unless the lumps caused by the condition are too bad to look at. Usually, there is no need to cure this condition. Treatment is usually necessary in cases where the skin surface looks extremely displeasing due to the presence of lumps caused by this disorder. Even when cure is required, the disease is found impossible to be resolved through a single treatment. This is because there is an absence of a specific cure for this disorder. Treatment options usually include medicated creams and self-care measures that aim at softening the keratin lumps on the skin and improving the bumpy appearance of the skin. These are medicated creams consisting of urea or salicylic, alpha-hydroxy or lactic acid that help soften and moisturize dry skin. This helps loosen and take out dead skin cells. Topical exfoliant creams are categorized into prescription and over-the-counter medicines based on their strength. Your doctor can provide valuable advice on which type of cream should work best for your skin. However, it is not recommended to use these creams on the skin of young children as the acids presents in these creams may result in irritation, stinging or redness in the skin surface. These are anti-inflammatory medications that suppress the immune system and help reduce cell turnover. Usually, Hydrocortisone or derivatives are recommended for treating widespread patches and sensitive areas such as the face. These are corticosteroid ointments of low strength. Doctors generally prescribe corticosteroids for short-term cure of the condition and alleviating the symptoms on a temporary basis. Stronger corticosteroid creams, when used for a long time, can cause side-effects such as thinning of the skin. They may also cause localized irritation itching or burning symptoms. Naturally, they are not used for long-term cure. Derived from vitamin A, retinoids work by promoting cell turnover and preventing the plugging of the hair follicle. Retinoids may be an effective treatment, but they can cause bothersome skin irritations, such as severe dryness, redness and peeling. Tretinoin (Retin-A Micro, Avita) and tazarotene (Tazorac) are examples of topical retinoids. Regular use of a medication may help improve the appearance of the skin. However, the condition often returns on stopping its usage. Even with medical cure, the condition tends to prevail for years. Gently dry the skin off after bathing or washing. Use a towel to slowly blot or pat your skin dry so that the skin retains some amount of moisture. Use a humidifier. This will add moisture to the air circulating within your home and keep your skin from drying off. Apply a lubricating cream or moisturizing lotion on your skin just after bathing, so that the body is still moist. Make sure that you use a lotion that contains propylene glycol, urea or similar chemicals that soften rough, dry skin. Apply an over-the-counter cream or lotion that contains lactic acid. Apply this on the affected skin regions twice every day. Lactic acid removes extra amount of keratin from the skin surface and helps in natural treatment of Keratosis Pilaris. The outcome of this disease can be quite variable. In some patients, KP papules often improve with age. This is a benign, non-contagious and mild skin disease that tends to be self-limited in nature. The hickeys caused by the condition may slowly fade with age. The pustules often spontaneously resolve with time. However, the condition may worsen or recur from time to time over many years. This is more or less a skin condition of a chronic nature. Many patients report of a deterioration of their symptoms in the colder months followed by an improvement in the summer months. The cosmetic appearance of skin from more widespread, irregular cases of KP can be a matter of concern. Moisturizers form a covering over the skin and prevent escape of water. Thicker moisturizers, such as over-the-counter brands like Cetaphil and Eucerin, show effective results for this skin disorder. Bathing in hot water for an extended period removes oils from the skin surface and make it dry. Naturally, it is better to use warm water and shower for a maximum duration of 10-15 minutes. Harsh soap brands dry off the skin surface and increases susceptibility to Keratosis Pilaris. Hence it is better to use mild soaps, such as Dove, Basis or Neutrogena, which contain added fats and oils. Your skin should ideally feel smooth and soft after bathing and never dry or tight. For the same reason, it is sensible to avoid antibacterial detergents and deodorants that are particularly harsh for the skin. Postinflammatory hypopigmentation – It causes change in skin tone which becomes lighter than usual. Hyperpigmentation – It causes unusual darkening of the skin and may occur after a temporary flare or following the improvement of the red, inflamed bumps. Soaking in the sun rays can be quite helpful for your health. This natural treatment is based on the observation that the condition usually gets better during the summer months while it worsens during the other seasons. However, too much sun-tanning is not recommended at all. It is better not to scrub your skin regularly. Scrubbing, of course, helps exfoliate your skin and gives it a smooth appearance. If you want to scrub at all, it is essential to rub the skin very gently. Forceful scrubbing or accidental removal of the plugs may irritate your skin and worsen the condition. It is recommended that you avoid using any of the skin sloughing products available in the market. Instead, use a soft towel to pat the skin dry after showers. Moisturizing lotions have a soothing effect on the skin and help improve its appearance. Using moisturizing skin creams along with medications containing glycolic acid, lactic acid, salicylic acid, vitamin D, urea and tretinoin may be recommended by your physician. Moisturizing lotions are often soothing and may help the appearance of the skin. Skin creams with medications containing urea, lactic acid, glycolic acid, salicylic acid, tretinoin, or vitamin D may be recommended by your physician. However, it often takes months to notice any improvement. The hickeys are also likely to come back on stopping medications. 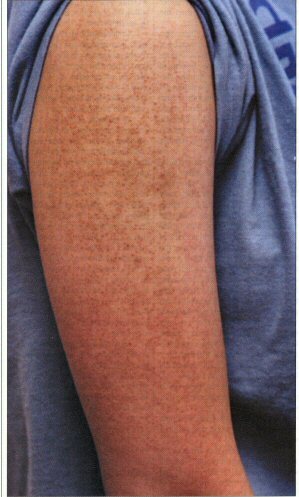 Here is a selection of some useful Keratosis Pilaris photos that will provide you with visual reference for the condition. Check out these Keratosis Pilaris images and get an idea about the physical appearance of people suffering from this disorder. If you suspect yourself to be having Keratosis Pilaris papules on your skin, call up your health care provider for an appointment. You should obviously discuss the condition with your doctor if your skin lumps do not respond well to the use of over-the-counter moisturizing lotions. A quicker treatment will help you make a faster recovery from this displeasing syndrome.